Recently stories about the initiatives in the Diocese of Madison by The Extraordinary Ordinary Bishop Robert C. Morlino to get tabernacles back into the center of churches have aroused some interest where tabernacles belong. I’ve gotten some email from people who write about their own local circumstances. Here is something interesting. 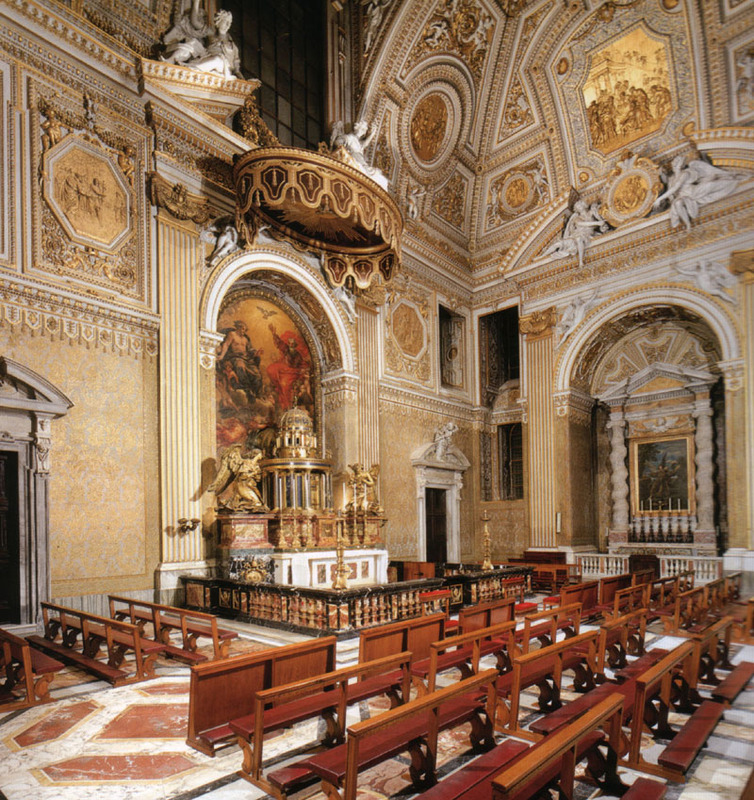 Pope St. John Paul II raised my parish to a Basilica. The original altar is in place, but the built-in, original tabernacle is hidden behind a triptych. Also, the presider’s chair sits directly in front of it. The “active” tabernacle is in a chapel of reservation. I’ve been told that the tabernacle has to be in a chapel of reservation because of the Basilica status – bringing in tourists and all. Then the inevitable, where would Father sit? I’ve looked online, but cannot find the answer: Is it a requirement of Basilicas that the tabernacle be in a chapel of reservation? Since the middle of the 20th century, many churches around the world have been granted the formerly-rare dignity of being named minor basilicas. There are currently somewhere in the neighborhood of 1700 minor basilicas in the world. In these United States there were 3 basilicas named before 1940. Currently, there are 82. In 1989, the Congregation for Divine Worship and the Discipline of the Sacraments, which has competence over basilicas, issued new norms for basilicas in document called Domus Ecclesiae. This document lists what requirements must be in place for a church to be considered for being granted the title of basilica. Nothing in the decree determines the placement of the tabernacle. Clearly, if there is high traffic from tourists and gawkers, having the Blessed Sacrament reserved in a quiet chapel can be advantageous. I can’t think of too many churches, outside of some of the major cities in Europe, that have this problem, perhaps St. Patrick’s in New York City, perhaps the Shrine of the Immaculate Conception in Washington DC. Unless there is a worthy, dignified, and prominent place for the reservation of the Blessed Sacrament, then the front-and-center placement of the tabernacle which has been the long-standing tradition of the Church should be maintained. No? Mind you, in the older Roman basilicas the Blessed Sacrament is often reserved apart from the sanctuary or body of the church, especially when bishops pontificate. It is brought to the altar in a procession with an ombrellino. However, for our purposes we are not dealing with a Roman basilica. Concerning Father being seated where God should be… according to that church’s architecture…. While there are some exceptions, such as for Popes and bishops in their dioceses for certain rites, it irks me to see some priest choose for himself the dead center, raised up on a dais, in a chair that Julius Caesar wouldn’t have dreamed of using. Plenus sui comes to mind. Priests have a hard enough time not being full of themselves when “presiding”, especially in the Novus Ordo and most especially when Mass is versus populum. C’mon Fathers! Get over yourselves! Learn something from our tradition and the wisdom of our priestly forebears! Go back to the use of a sedilia, on the side of the sanctuary facing inward, towards liturgical North, not facing directly out at the people as if you were the 5th apparition of Vishnu for them to gaze at in wonder. If you don’t have a proper sedilia, a dignified chair with two other stools (for your deacon and subdeacon) are more than adequate. The old ways help to keep us under control! We are even supposed to keep our eyes downcast, so as not to attract too much personal attention and so as not to be too distracted. This entry was posted in "How To..." - Practical Notes, ASK FATHER Question Box, Liturgy Science Theatre 3000, Mail from priests, Priests and Priesthood and tagged Domus ecclesiae, minor basilica, tabernacle. Bookmark the permalink. 20 Responses to ASK FATHER: Where should the tabernacle be in our Minor Basilica? Denver’s Cathedral Basilica of the Immaculate Conception has the tabernacle atop the high altar, even though the low altar is the one used most of the time for now. …Go back to the use of a sedilia, on the side of the sanctuary facing inward, towards liturgical North, not facing directly out at the people as if you were the 5th apparition of Vishnu for them to gaze at in wonder. Some of your best lines yet! I recall being at St. Patrick’s a few years back for the last Sunday of Advent, and wishing how Mass could have been in a smaller chapel. I arrived 15 minutes early to spend time in prayer and spent most of it pushing through crowds and grumbling instead of adoring. The crypt is a wonderful place in DC for more a quiet experience. I went to a college that had a basilica and was always surprised that the Tabernacle was off to the side. My wife and I were in Rome when we engaged and we loved being able to pray at the smaller side altars in different major basilicas. Yeah, on the Main Level at the DC Shrine the Tabernacle has it’s own chapel off to one side. And then there’s a Tabernacle on the lower level in the Crypt Church. Both are good, and there’s signs (pretty sure there are at the Main Level, def at the Crypt) that mention being quiet. Most people are quiet in the whole place. I really like visiting that Church. In a discussion elsewhere, it was pointed out by someone as a retort that St. Peters does not have the tabernacle located front and center, but in a side chapel. And what a side chapel! Even aside from the consideration of the large volume of non-Catholic visitors St. Peters sees, I rather suspect that if any church in the Diocese of Madison had even remotely as magnificent of a Eucharistic chapel to honor Our Lord with, directly accessible from the nave of the church, the bishop would seriously consider allowing them to keep the tabernacle there as an exception. The bottom line is to convey the reality that Christ is truly present before us and that the architecture of the church should in some way reflect this fact. The simplest, most obvious, least mistakable way to do so is to put the tabernacle on the center of the high altar. In the overwhelming majority of churches, there is no reason to make it more complicated than this. There’s a shrine for perpetual Adoration in my city and it’s always annoyed me that the presider’s chair is right behind the Altar, especially since the Order that runs it is very traditional and reverant. Is there no reason that a church couldn’t have the Tabernacle on the High Altar and still reserve the Blessed Sacrament on a side altar or chapel for Adoration, like in a monstrance? I second the call for priests not to make themselves the front and center focus of attention during the mass by sitting on a central throne or facing the people during the Eucharistic Prayer. Side sedilias and versus orientem! You know it makes sense in this era of humility and mercy! At the Basilica of Sts. Peter and Paul, Lewiston ME the tabernacle is located in the center of the grand high altar which is no longer used for Mass, instead a new but tastefully designed altar was erected closer to the front of the sanctuary but fortunately far enough back so that it can be used Ad Orientem, for example our Extraordinary Form Sunday and Holy Day Masses.The priest and other ministers sit in chairs off to the right (liturgical North) side as is proper and fitting. This is the Parish I worship at everyday, in fact I have a few years back asked that Father and Father Z make arrangements that if possible someday Father Z could Celebrate TLM Mass. It truly is a beautiful church, and I am with Father everyday on the Alter except Saturdays, Latin is used in all the Mass’s and we are there living the Mass everyday. I would love to see the communion rails back and the sign removed from the sanctuary, but pray, fasting and hints to Father are there. Baby steps. Adoration is held Mon, Wed, Fri: 9am – 5pm in the Side Chapel. Father Z I would encourage you to visit sometime, maybe then we could see some more positive changes!! I love Father and I love our Parish and Basilica, there is always room for improvement on this journey to see our Lord. I have just created a file called “Liturgical norms” into which this column will go, and wish that I had done so earlier. You could save me a lot of trouble if you would put columns such as this in a book. Most liturgical writing is very dry and without a voice, but columns such as this are not only instructive but memorable and quotable. By this point it is only a question of assembling what you have already done, and for that matter I imagine that you would have little trouble finding someone willing to undertake that task. Placing the chair where the tabernacle sits irks me as well. At times I think “I came here to worship God, not you” and at other times I feel like Mary Magdalene thinking “They have taken my Lord away and I don’t know where they have put him”. There is a truly Catholic solution to this problem. The Catholic faith is “both and” and heresies most often spring come from “either or” thinking. It is good and proper that the sacrament be adored, but we need the Lord to be the center of our worship. Why not reserve the sacrament in both locations? If one is unmoved by the longing for Christ to be at the center of our ship, from the practical standpoint, not only can the blessed sacrament be made more accessible and protected, it also allows the sacrament to be more accessible to the priest during mass. I suspect that a reason for a good priest to put his chair in a place of pride is a baby step in the right direction: he, the priest, is not just one of us. He is ontologically changed, and stands as an alter Christus. Isn’t there a tradition that Cathedrals have the Tabernacle apart? And, in Rome, the major basilicas. Some of the most famous minor ones, such as Il Gesù, don’t. Obviously a priest is not just “one of us.” But being an alter Christus doesn’t make you the Christus worshipped on the altar. So no, there really isn’t a “bright side” to this kind of liturgical abuse. Father moves his chair to the center to proclaim himself God, constantly worshipped and adored, or a secular leader/king, constantly the cynosure of all eyes. He may do it out of ignorance, but he does it. 310. The chair of the priest celebrant must signify his office of presiding over the gathering and of directing the prayer. Thus the best place for the chair is in a position facing the people at the head of the sanctuary, unless the design of the building or other circumstances impede this: for example, if the great distance would interfere with communication between the priest and the gathered assembly, or if the tabernacle is in the center behind the altar. Any appearance of a throne, however, is to be avoided. It is appropriate that, before being put into liturgical use, the chair be blessed according to the rite described in the Roman Ritual. Likewise, seats should be arranged in the sanctuary for concelebrating priests as well as for priests who are present for the celebration in choir dress but who are not concelebrating. The seat for the deacon should be placed near that of the celebrant. Seats for the other ministers are to be arranged so that they are clearly distinguishable from those for the clergy and so that the ministers are easily able to fulfill the function entrusted to them. 311. Places should be arranged with appropriate care for the faithful so that they are able to participate in the sacred celebrations visually and spiritually, in the proper manner. It is expedient for benches or seats usually to be provided for their use. The custom of reserving seats for private persons, however, is reprehensible. Moreover, benches or chairs should be arranged, especially in newly built churches, in such a way that the people can easily take up the postures required for the different parts of the celebration and can easily come forward to receive Holy Communion. Care should be taken that the faithful be able not only to see the priest, the deacon, and the lectors but also, with the aid of modern technical means, to hear them without difficulty. 312. The choir should be positioned with respect to the design of each church so as to make clearly evident its character as a part of the gathered community of the faithful fulfilling a specific function. The location should also assist the choir to exercise its function more easily and conveniently allow each choir member full, sacramental participation in the Mass. 314. In accordance with the structure of each church and legitimate local customs, the Most Blessed Sacrament should be reserved in a tabernacle in a part of the church that is truly noble, prominent, readily visible, beautifully decorated, and suitable for prayer. The one tabernacle should be immovable, be made of solid and inviolable material that is not transparent, and be locked in such a way that the danger of profanation is prevented to the greatest extent possible. Moreover, it is appropriate that, before it is put into liturgical use, it be blessed according to the rite described in the Roman Ritual. 315. It is more in keeping with the meaning of the sign that the tabernacle in which the Most Holy Eucharist is reserved not be on an altar on which Mass is celebrated. Or even in some chapel suitable for the faithful’s private adoration and prayer and organically connected to the church and readily visible to the Christian faithful. 316. In accordance with traditional custom, near the tabernacle a special lamp, fueled by oil or wax, should be kept alight to indicate and honor the presence of Christ. 317. In no way should all the other things prescribed by law concerning the reservation of the Most Holy Eucharist be forgotten. What I could find on why our Basilica is set as it is. Thank you, Stitch. That was a helpful reminder of what the Church has to say! My instincts tell me though, that there is something not quite right about hiding and sitting with one’s back to a tabernacle that, for decades (maybe even a century, depending on the age of the basilica) was the beautiful resting place of God on Earth…just my own, personal feeling related to respect for the Real Presence. Unfortunately, some bishops are comfortable with tabernacles removed from the place of pride and actively work against moving them back. Yeah, I would love to see the Church return to the old setup, maybe some day it will. I am just glad that the Lord has blessed me with a Parish to worship in that doesn’t look like random so called “modern art”.